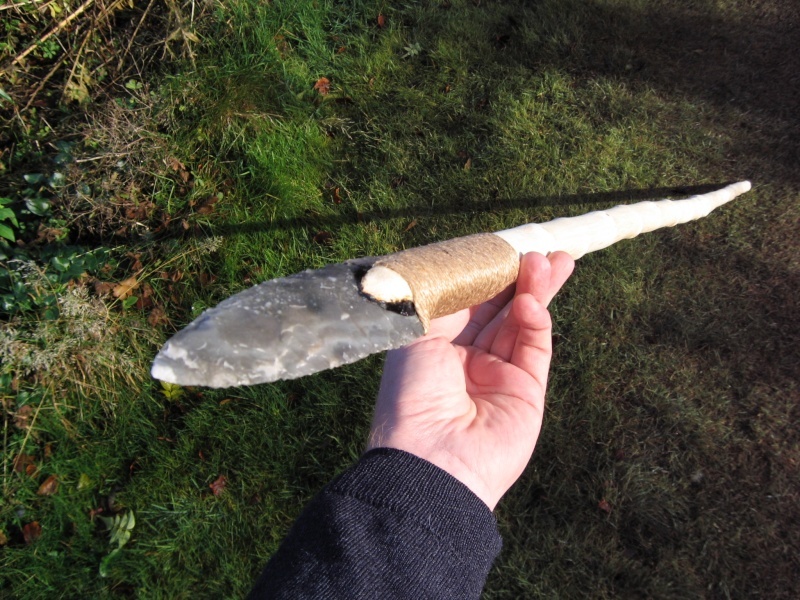 Made this Solutrean style flint spear during the summer as a demo for the archaeology week, I wasn't easy as I was using only flint tools to chop down the branch and strip it bare, split the end and carve it to shape, then knap the spearhead itself using "abo" tools, the tip turned out a little chubby but I'm happy with it. 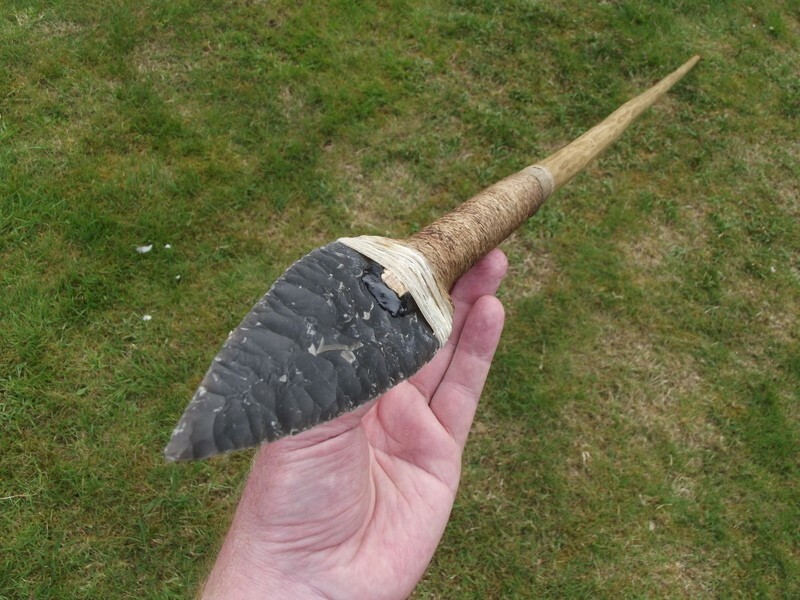 Next year I think I'll just do a blade core or handaxes, this was a bit ambitious as I ran out of time and ended up fixing the tip and binding at home, but was able to show the folk a "dry run" with the spearhead in place and nettle cordage wrapped around the shaft. [img] [/img]I ended up using the jute cordage instead of the nettle string as the piece I made was a little on the short side, the blade is fixed with pitch pine glue, and the wood used was Sycamore (Acer pseudoplatanus) as the groundsman at the museum hates the stuff, so he didn't mind me chopping some down, I think it's not a native tree and anyway it grows like weeds all over the shop! Well, there's a challenge for over the xmas hols. I thought about hafting a few spearheads, then I thought where am I gonna keep the spears after I hafted them. I would make two, then mount them crossed over on the wall! Thinking about it they would make great Christmas presents, imagine the faces of the people you give them too. Next year I may do it. He he! and some furry leopard print pants to go with... priceless. 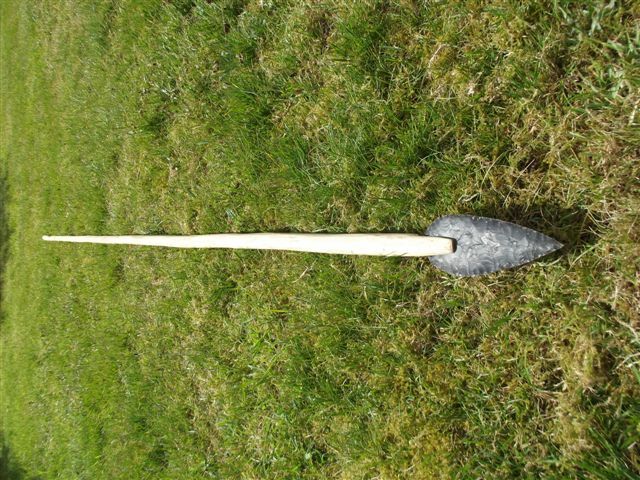 Cool spear, and the chubbier the scarier if you ask me.. 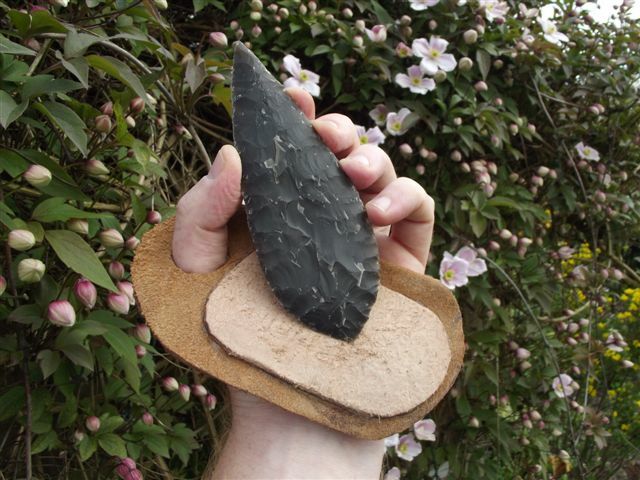 I often start off with the intention of making a spear head but end up with a selection of arrowheads and knife blades. i almost had one on thursday but borked it up just as i was getting that hang of thinning the bugger, or so i thought, but at least i have a couple of decent blanks/preforms for playing around with this week. The days of getting annoyed with breakages are long gone! Experience is a great teacher, if not an overly sympathetic one. ETA: i think sycamore has been in the uk for a millennia or two, but originates from the balkans iirc... good thing is that woodland managers rarely mind them being butchered as they grow so quick shading the natives out, and the mahoosive leaves take ages to decompose on the forest floor too so screw with wildflowers and such. They quickly self coppice pretty good from the stump though when felled and can be a good source of skewers/staves/poles etc. Not bad wood, they're related to Maple. mr.hertzian cone wrote: Not bad wood, they're related to Maple. 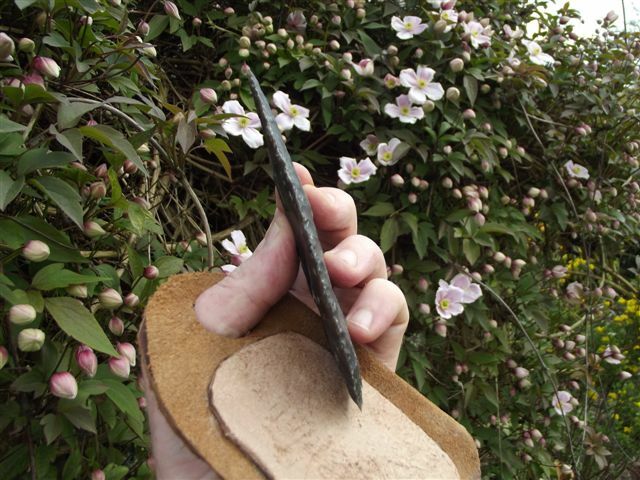 i'm coming round to the idea of it being usable, trouble is for the last few years i've spent a lot of time with a seasoned bodger/hedger felling loads of them through my last employer and he never had a good thing to say about them... even the woodcrafting site we had refused to use them for owt but firewood/charcoal. I've wood stained the beast and used some tinted wax polish for display, looks better for my efforts. Next one will be in Hazel, it's my new favourite wood. Fewer knots and straighter. Also I have a pole cut and ready. That helps! mr.hertzian cone wrote: Next one will be in Hazel, it's my new favourite wood. Fewer knots and straighter. Also I have a pole cut and ready. That helps! 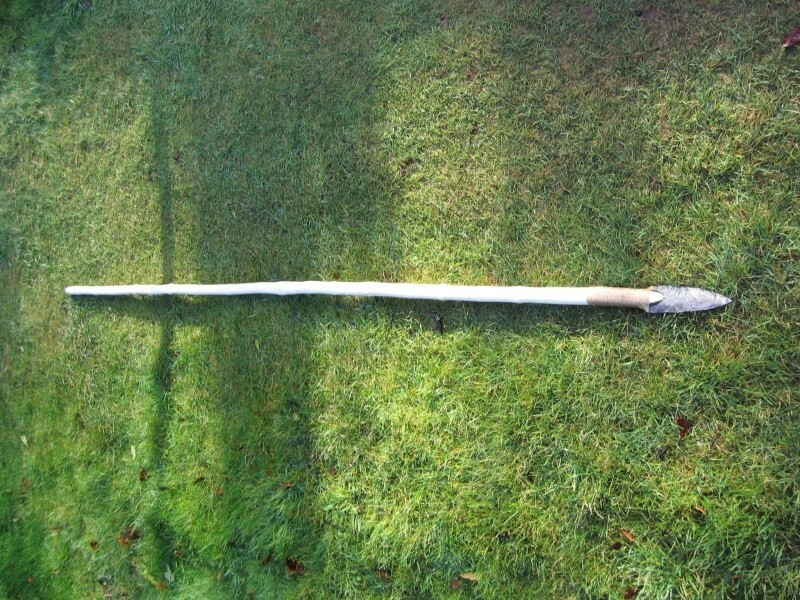 I think Hazel would of been used a lot, its great for friction fire and it is native to the uk.
" />The binding is raw hide I think.
" 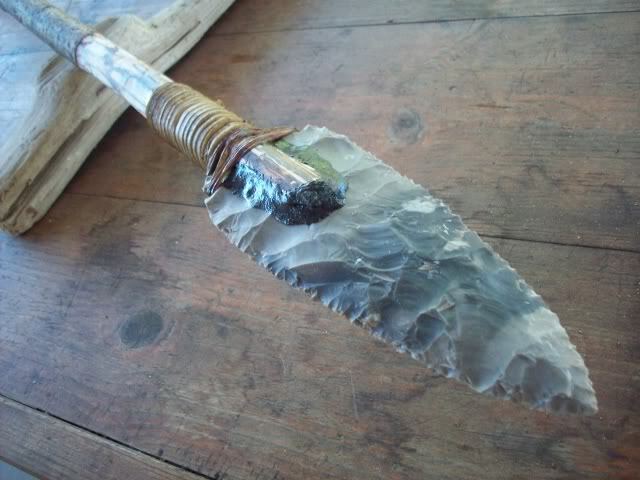 />Found some decent black flint and decided to make another flint spear, this is the spearhead after the final pass of pressure flaking. Test fitting on a 7 foot hazel pole. 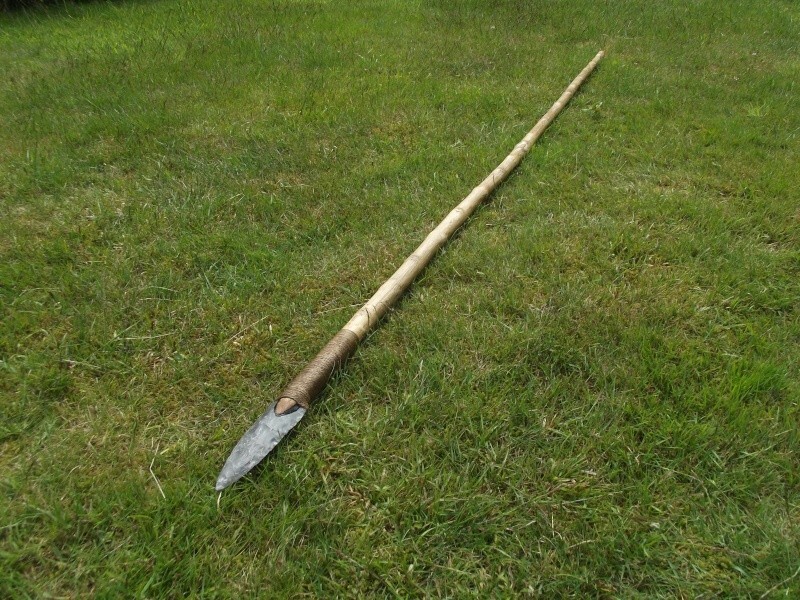 Now I've got my photos back I can tie up some loose ends, here is what the spear turned out like with some binding. wow - some work gone into that. That's a hell of a pressure flaking job. 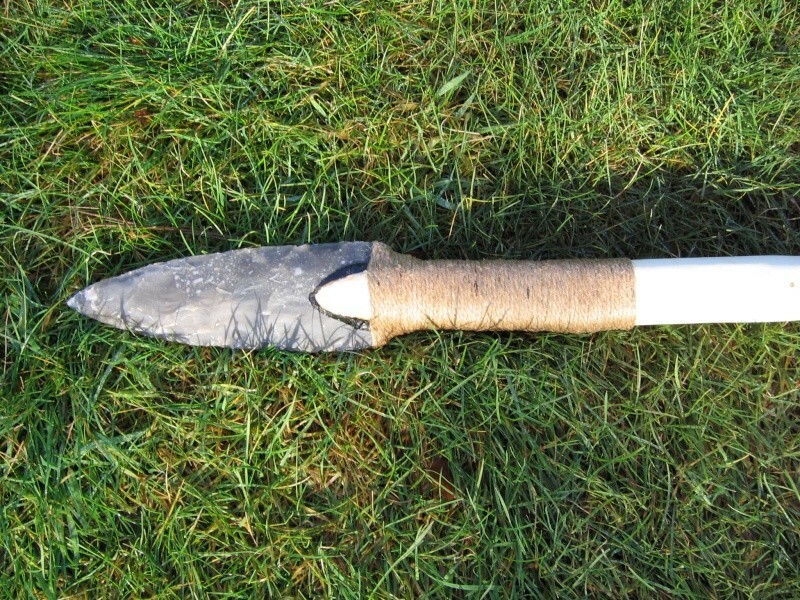 What flint are you using? Ah, it's invasive pressure flaking (using the knee squeeze as added uph) with a sharpish steel tip over percussion. the flint I think was some of the better stuff from the beach, or it maybe one of the flat nodules I picked up from a field in west Norfolk. It's not often I get blemish free flint from either of those sources but it's good to make the best of it.